The interior of a homestead courtyard with a byre (luak) in the background and parts of the framework of two storage platforms visible in the foreground, one with maize cobs hanging from it, apparently being sun-dried. Next to the byre (luak) is a forked post with another bunch of maize hanging from it. It is possible that this is a riek shrinEvans-Pritchardost with offerings attached, but may well be just utilitarian. Evans-Pritchard stated that it is often not possible to distinguish between sacred and utilitarian posts in photographs. 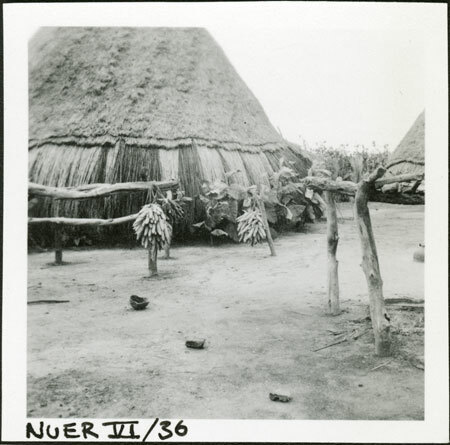 Maize was harvested sometime around late July which corresponds to Evans-Pritchard's fieldwork in eastern Nuerland among the Gaajok at the mouth of the Nyanding. Note on print reverse ms pencil - "3" & print front border ms ink - "NUER VI/36"
Morton, Chris. "Nuer maize crop" Southern Sudan Project (in development). 03 Jan. 2006. Pitt Rivers Museum. <http://southernsudan.prm.ox.ac.uk/details/1998.355.265.2/>.